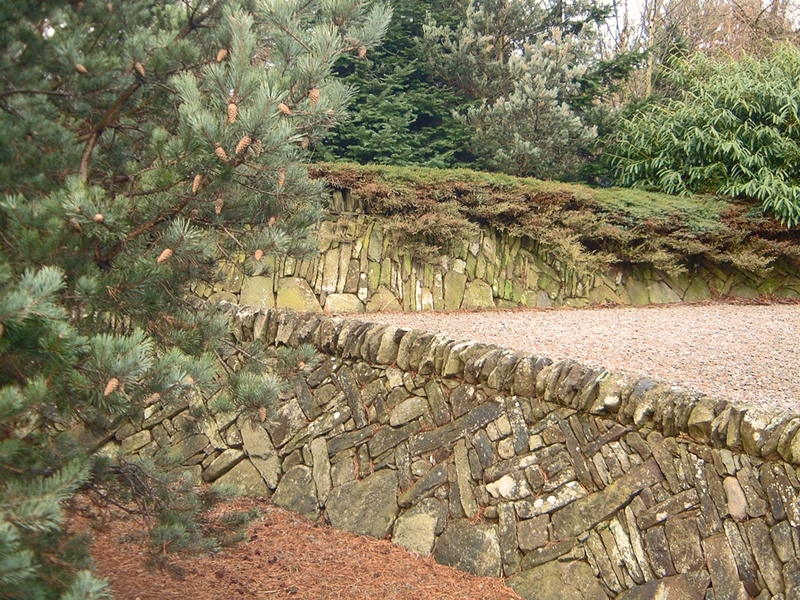 A large scale landscape project that involved designing a series of wall features to work in combination with soft landscaping to create an interesting and attractive environment to a site that is a main gateway into Scotland. The walls are situated around the site; on the two roundabouts either side of a flyover, and on the main approaches to the interchange. Laid-out in a series of ‘star/flower’ shaped areas, conceptually it was hoped that with the use of traditional materials and plants the landscape would suggest to the viewer a feeling of ‘Scottishness’. The walls are constructed to have a dry-stone (field dyke/wall) effect. In the coursing of the walls is a pattern. This was to add interest and emphasise the feeling of movement around the site. Centrally within the bays of the walls the coursing becomes a ‘herringbone’ pattern. I was appointed through Dundee Public Arts Programme & Lothian & Edinburgh Enterprise Ltd (LEEL), to work with the Landscape consultants Turnbull Jeffries to produce a scheme for the site. Working closely with Keith Horner of TJ. we designed the proposals over a period of weeks. I remember the initial telephone call to ask if I was interested, ” some roundabout near Edinburgh Airport” I was told, expecting maybe a small mini roundabout. And then being blown-over at the first site visit realising the true scale of the project. The walling work was undertaken between Nov 92 – April 93. Prior to Christmas 92 I employed mason Duncan Strachan to work alongside me. After that time he decided that this project wasn’t for him, something to do with the weather I think – that period being the wettest on record! This left me in a crisis, a tight deadline with no help!! After a few false starts, (one mason only staying for 15mins) I found, to my relief, a dyker who was what I was after – he walked onto the site and told me ” I could build better than that”. Stuart Amos my saviour ! This project has won a BALI Landscaping Award and is also part of the work for which I have received a Pinnacle Award from the Dry Stone Walling Association of Great Britain.